THE TRUTH ABOUT HARRY HOUDINI. 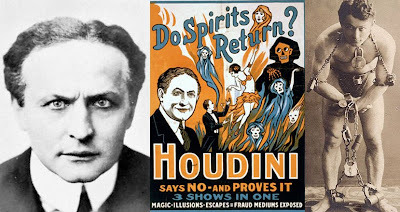 (Ehrich Weiss 1874-1926) also known as Harry Houdini, the magician was very close to his mother, and her death in 1913 was the greatest tragedy of his life. For weeks after her death, he made almost daily visits to the cemetery, sometimes lying on her grave to speak to her. After this tragedy, Houdini renewed an eager interest in spiritualism, the so-called ability to communicate with the dead. Although Houdini wanted to believe that such communication was possible, eventually he became a recalcitrant skeptic. Houdini had a standing offer of $10,000 to anyone who could produce a psychic effect that couldn’t be reproduced by natural means, but no one ever collected the money. Unfortunately he could not find a genuine medium because many mediums of that time were not prepared and they always distorted the messages. Interlocutor: Was the mission of David Copperfield only to entertain to the audience? Ron Hubbard: No, his specific mission was to investigate the paranormal phenomena, in the same way Houdini did, although he was devoted to pursue all the mediums, because he didn't believe in the mediumship. Interlocutor: I remember that Houdini tried by all possible means to contact with his mother... Did he achieve it? Ron Hubbard: Finally he did, but he didn't believe he did it, because he thought he had hallucinated. Interlocutor: I can hardly believe it... So much effort for nothing! Did Houdini fail in his mission? Now we know that his mission had been to study paranormal phenomena. Ron Hubbard: He failed completely. Houdini became a recalcitrant skeptic. Interlocutor: After disembodying, when Houdini was already a spirit, Did he try to contact with his wife? Ron Hubbard: When Houdini disincarnated he went directly to the plane of Error 3, because he was very imbued in his ego. He tried to communicate with his wife, but he was not listened. Interlocutor: That is to say, from his wife's point of view, Houdini was never listened, therefore nobody won the famous ten thousand dollars he had offered as a reward. Ron Hubbard: That’s right. Occasionally she perceived in her mind the communication of her husband, but she believed she was hallucinating and she rejected it. Interlocutor: Well, this topic is clarified. This entry was posted at Wednesday, June 17, 2009 and is filed under Who are they? . You can follow any responses to this entry through the .